What was once a solution for keeping flies out of drinks (the word ‘tapa’ means to cover) has now become an amazingly informal way to sample top quality ingredients and dishes from each region in Spain. Here are the unwritten rules we share with our clients to make sure they get the very best tapas while in Spain. A tapa was traditionally something to enjoy with a drink as you whet your appetite before having lunch or dinner at home – and today, not much has changed for the Spanish. When you meet somebody Spanish for tapas in Spain, you are meeting for a drink and a bite to eat – usually around 1.30-3pm or 8.30-10.30pm. 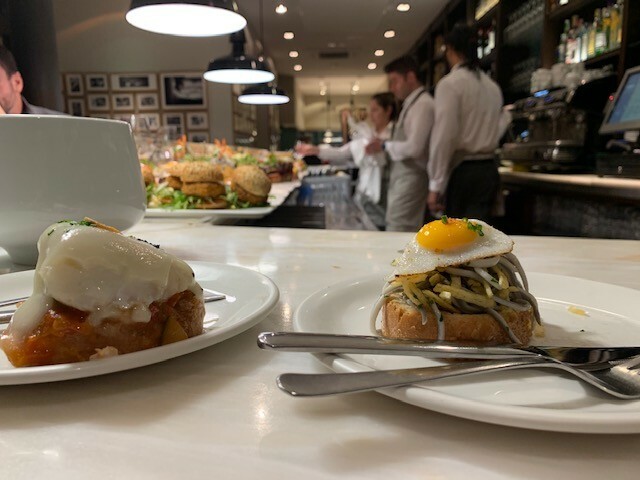 The way you meet for tapas in Spain explains it all – you say “Quedamos para picar algo?” meaning “Will we meet to pick at something?” which is very different to meeting for lunch/dinner “Quedamos para comer/cenar?” which implies sitting down at the same table for 2-3 hours. When you plan to go for tapas, try to stick to the Spanish times of 1.30-3pm and 8.30-10.30pm to guarantee the freshest of food and the best of atmospheres. Tapas in Spain means going to one bar and perhaps continuing to another, and maybe even another. This often happens when you (or the person you have met up with) bump into other friends and you all agree to move onto a different bar with them. You may have to stand in some of the bars or you may be lucky and grab a stool and maybe even a table. But you never book a table in a tapas bar as people are always coming and going and you never have to wait too long. If it is very busy, you might be asked to put your name on a waiting list and the waiter will nudge you when a place is available. The exception is if you are meeting up with a large group – in which case you might have to ring ahead and book a table and give them a heads-up with any special requirements and will be directed to ordering ‘raciones’ which are shared platters. This bar in San Sebastian is the kind of place you should feel comfortable ordering tapas or ‘pintxos’ as these skewed tapas are called. Image via Flickr by Txmx-2 licensed under a Creative Commons licence. Tapas bars are usually that – bars or taverns, rather than cafes or restaurants. And the best tapas bars are usually surrounded by other quite decent tapas bars. They’re not in competition with each other – but creating the perfect environment for a few hours of tapas. It can be hard to know where these tapas streets or neighbourhoods are. They usually aren’t a main street or square and the bars themselves can often look very plain and anonymous or indistinguishable from the outside. Ask the staff at your hotel to give you recommendations. When we prepare client itineraries we always recommend great tapas bar neighbourhoods (called barrios) for each of their destinations – places such as the Cava Baja in Madrid; the Barrio Humedo in Leon; Granada Street Neighbourhood in Malaga; Puertochico Area and Tetuan in Santander and Laurel Street in Logrono, La Rioja. If you’re Spanish, the first thing you look for in a tapas bar is people. You have to choose a place that’s popular because the last thing you want is a saggy-bottomed or dried-out tapa so you choose places that have a high turnover of people and food. Because you’re only going to be in each place for up to one hour before moving on – Spanish people rarely worry about decor or facilities for their tapas bars. It doesn’t have to look amazing – it just has to look like the people are having fun and eating as well. And if you see the floor looks a bit messy with paper napkins and cocktail sticks strewn onto the marble floor– don’t panic – it’s the sign of an authentic place, really! We like the types of places that have the specials written on a blackboard. And if you can see a bit or all of the kitchen, even better. With tapas, you’re not looking for a swanky place – you’re looking for a decent cook or chef. Whatever you do, avoid empty bars – and if all the tapas bars in the neighbourhood are empty, you’ve timed it wrong. First of all, avoid tapas bars that are called tapas bars – they are 100% targeted at the tourist market and while nothing is wrong with that, it’s going to be quite like what you enjoy at home. Language can also be a clue – listen for Spanish speakers (or Catalan, Basque or Galician as appropriate) and if you can’t hear any, you should start asking yourself why. Menus can also give an indication – if you are offered a tapas menu in English, you’re probably dealing with somewhere pretty touristy so don’t order huge amounts just in case the standard isn’t great. Places that serve tapas all-day long are generally not where you’ll find the Spanish so if it says all-day tapas, you can be sure that it’s not targeted at the Spanish market. If you understand all of the menu or can identify everything at the bar, that should be another warning sign – even the Spanish won’t be able to understand all the menu or identify all the food in front of them – they’ll often have to ask what something is or how it is served. Sometimes you think a place looks great and authentic from outside but when you go in, something seems a bit off. Maybe it’s the absence of that smell of food cooking. Perhaps it’s a whiff of bleach or some other cleaning product. Whatever it is – don’t worry about offending – just turn around and leave. Or if that seems too rude, just order and pay for a bottle of water and stick it in your bag, and leave. When you’re in a place you like, it’s time to order. And the first thing you do is get your drink order in. The great thing about tapas bars is that you can order whatever you like – as everything is ordered by the glass. If you have grabbed a table and don’t want to move bars any time soon, you could order a bottle of wine – but the Spanish rarely do this. In general, the Spanish would order a glass of draught beer or a glass of white, red or rose wine. In Catalonia, you might want to order a glass (or bottle) of cava. In Andalusia, why not try a glass of manzanilla sherry. In Asturias, you should order a cider (normally by the bottle). And if none of those appeal, perhaps a vermouth (written ‘vermut’ in Spain) is right for you. Spanish vermouths tend to be red but if you prefer white vermouth you can order a white Martini. We are fans of the local Siderit brand of red vermouth here in Cantabria but wherever you are you’ll find a decent ‘vermut’. If you’re not drinking alcohol – we recommend ‘mosto’ which is a grape juice or a ‘cerveza-sin’ which is an alcohol-free beer. Bitter-Kas is another good option. You can also enjoy water or a tonic water. Check out our post on 18 different alcohol-free drinks in Spain. In Madrid, it’s not guaranteed but you’ll often get a few crisps, olives or chorizo when you order a drink. 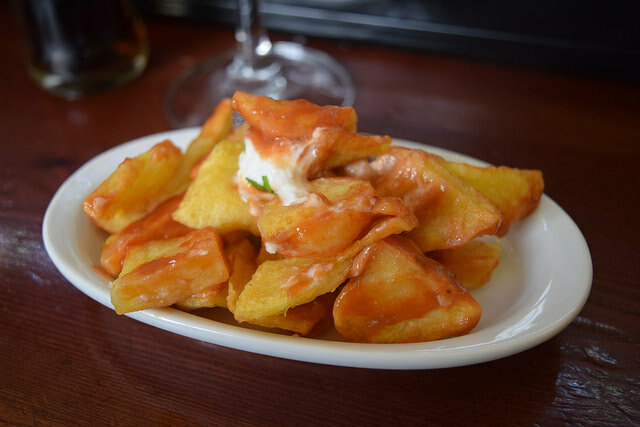 If you are visiting the university cities of Leon and Granada, tapas are nearly always free and are often substantial eg a serving of Russian salad, croquetas, patatas bravas or whatever else the kitchen decides to serve on that day. Elsewhere, you often get a free ‘tapa’ but you will only get it, if you put in an order for a drink, and wait a few minutes before ordering food. The free tapa is the waiter’s way of encouraging you to stay and letting you sample the food there to whet your appetite. This is the kind of free tapa you’ll find in bars across Leon, Granada and even Madrid. Image by Haydn Blackey via Flickr licensed under a Creative Commons licence. Finally, it’s time to order tapas. 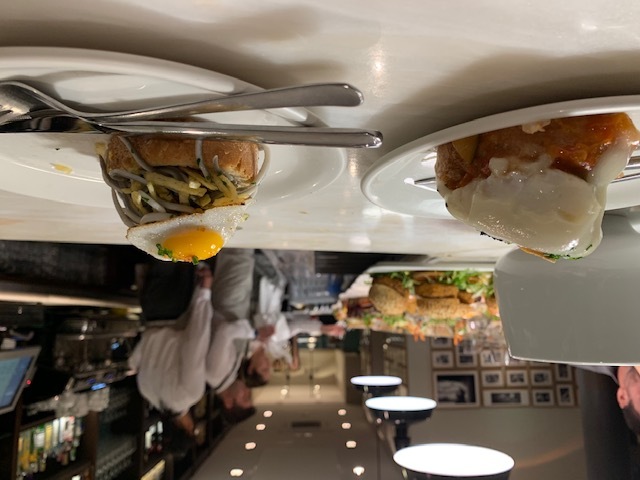 You probably know by now that tapas here in Spain usually refer to the ones that are served on top of a piece of bread. They are often known as ‘tostas’ or ‘pintxos’ and are meant for individual consumption. The tapa that comes on a plate or earthenware bowl is called a ‘racion’ and is usually meant to be shared. 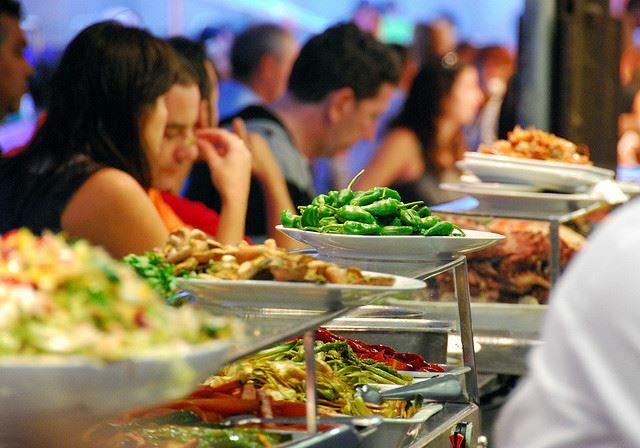 (We’ve written about the Importance of Sharing Food in Spain here.) 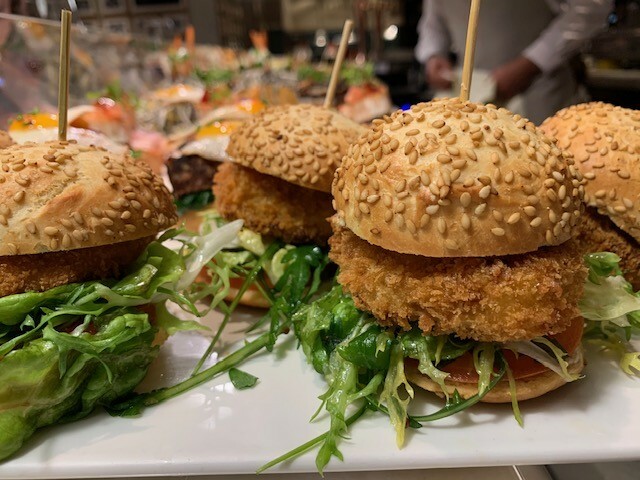 Take for example the prawns in garlic, platters of jamon or manchego cheese, meatballs, calamari, patatas bravas and croquettes – these will all be on the ‘raciones’ menu. Pintxos are the tapas on show under the glass protection at the tapas bars. The ‘raciones’ are listed on the board of specials or the ‘raciones’ menu as they are prepared in the kitchen area rather than the bar area. Pintxos often come skewered with a cocktail stick and the bar staff will sometimes count the cocktails sticks to work out what to charge clients. 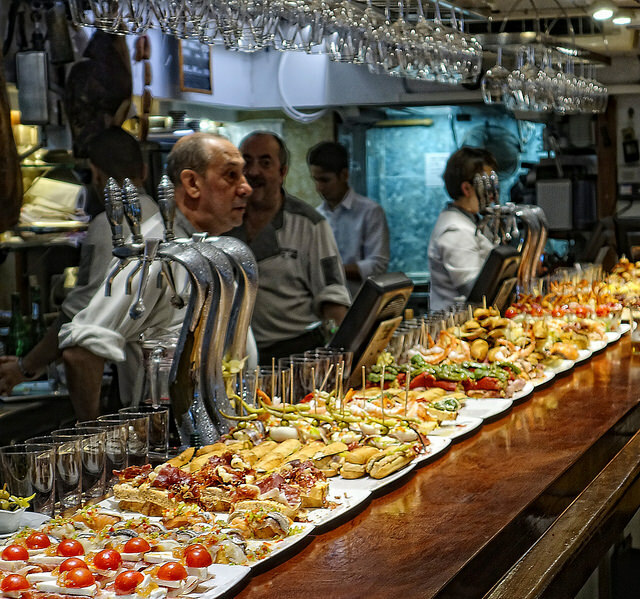 When Spanish people meet for tapas, they will usually order pintxos if they are standing at a crowded bar. When they find a table or more room at the bar counter, they will move onto ‘raciones’ which require a bit more space. If you’re looking at a tapas menu, the price will usually indicate whether something is a pintxo or ‘racion’. If it costs more than 5 euro, it’s probably more food than will balance on a piece of bread – and hence it’s more suited to sharing with somebody. Pintxos generally cost 2.50-5 EUR each. The shared platters called ‘raciones’ are more expensive and could be anything from 6-20 EUR depending on what you order. If it seems a bit pricey it’s probably an extremely expensive cut ie jamon ibérico de bellota or Dublin Bay prawns. If you are eating alone, you should order ‘pintxos’ or ask for half ’raciones’ as many places are now happy to serve half-priced half-portions. We often get asked about the number of tapas to order. We generally estimate a pintxo and a racion per person is enough with bread. That would mean four people could order a pintxo each in one bar and move on to another, sit down and order four raciones to share. When selecting which raciones, always aim for a mix – perhaps one meat, one fish, one salad and a wild card. Can’t see your favourite tapa anywhere on the bar or the menu? Many of the tapas you enjoy in your local tapas bar outside Spain aren’t going to be available in every tapas bar you go to in Spain. In fact, some of the best tapas bars will have a very limited menu – preferring high standards of excellence over variety. You’ll just have to keep trying in more tapas bars to get your preferred item. 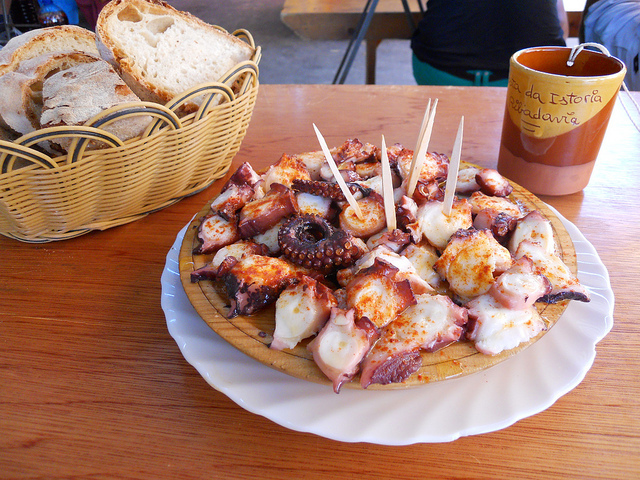 A ‘racion’ of pulpo meaning octopus is one of our favourite tapas in Galicia – perfect for sharing amongst 2-4 people. Image via Flickr by José Antonio Gil Martínez licensed under a Creative Commons licence. Although very loyal to and proud of their own region and its food and traditions, the Spanish love to sample the delicacies and specialties from other Spanish regions when they travel inside Spain. Here in Cantabria for example holidaymakers love to order the calamari called ‘rabas’ plus the anchovies, Northern tuna and local blue cheeses from the Picos de Europa mountains. In Madrid and Castile, Spanish visitors want to sample the wonderful cured meats such as jamon, chorizo and cecina. When visiting cities in Andalusia, the Spanish want to try fried fish called ‘pescaito frito’ as well as grilled shellfish and soups such as ajo blanco, salmorejo and gazpacho. And anybody visiting Galicia will be keen to enjoy a ‘racion’ of octopus, and ‘lacon’ which is ham seasoned with smokey paprika, and the wonderful pimientos de padron peppers. Whenever you are in Spain, it certainly pays to look around before you order – and be brave – no dish is going to break the bank so live a little and order whatever you see your neighbour enjoying – especially when you can’t recognise it. Confused? Spanish people innately trust the serving staff in a bar or restaurant and will reach out and ask for advice. What’s good, they’ll say. What do you recommend? They rarely know what they want in advance unless they know the bar and will therefore know what they do best. That’s why it’s worth asking the staff or looking around at people’s plates before looking down at a menu. If you see something you like and don’t speak Spanish, point at it to the waiter and imply you’d like one of those. If you or somebody in your travelling party requires special assistance – again, highlight this to your waiter or barman. Gluten-free diners will find ‘raciones’ menus much more flexible than pintxos (which are by nature on a piece of bread). Read more about ordering gluten-free in Spain here. Vegetarians and vegans will find the choice of tapas and ‘raciones’ delicious but rather limited – read about ordering as a vegetarian/vegan in Spain here. Anybody who needs to control cholesterol or salt consumption, should probably avoid pintxos and opt for ‘raciones’, requesting anything that can be prepared ‘sin sal’ meaning ‘without salt’. Tapas by their nature are savoury so if you are on a sugar-free diet, you’ll need to be more careful with the drinks rather than the food but you should ask whether anything ‘contiene azúcar’. Travelling with children? Read our guide to eating out with the family here. 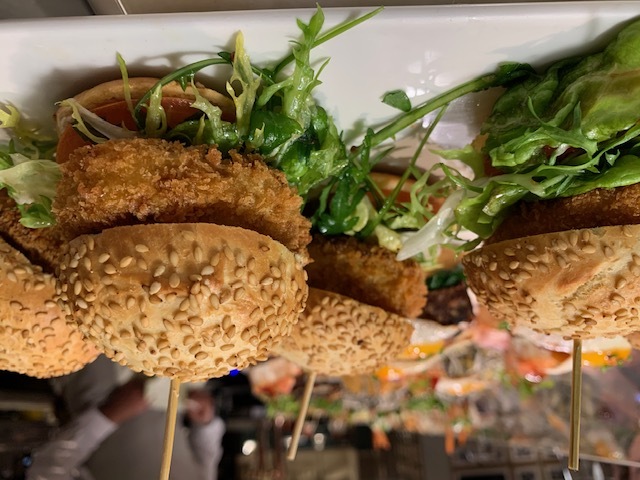 There’s something for everybody’s taste buds in the many tapas bars of Spain such as these mini-burgers which are beloved by young and old alike. Image by Pamela Cahill All rights reserved. 12 Any Dessert & Coffee after Tapas? For those of you who are sweet-toothed, you might be disappointed to learn that the Spanish rarely order dessert after tapas. If you love ordering dessert after a meal, aim to finish up at a tapas bar that also offers dining a la carte, and chances are you will find some classic desserts such as ‘flan’ meaning creme-caramel and ‘arroz con leche’ meaning rice-pudding available. If you can’t get anything sweet, go to a decent ice-cream parlour or a churros stand afterwards. 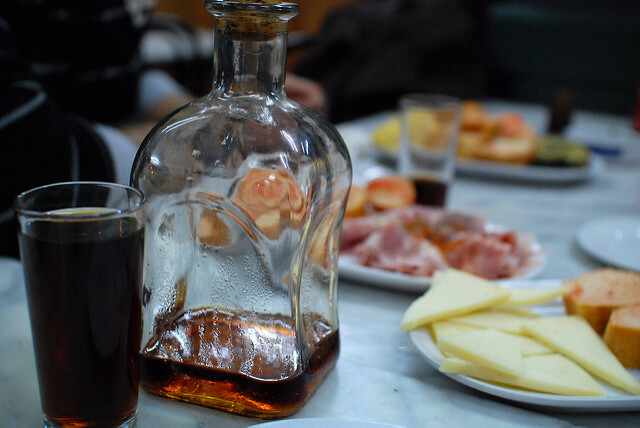 If you need a coffee after your tapas, bear in mind that some don’t even do coffee – as they are 100% focused on their food – they might instead offer a digestif or a shot of ‘orujo’ which is a strong liquor from Galicia. If you can’t get a coffee in the tapas bar, find a cafe afterwards that does and settle in with your ‘cafe solo’ or ‘cortado’. Wherever you are in Spain, you always pay after the drink and tapa are consumed, rather than when it is served. When going from bar to bar, Spanish people will operate a loose type of round system or else split the bill. If it’s known that a few bars are on the cards, a group might even put together a ‘bote’ meaning kitty to compensate for the variety of pricing and food ordered from bar to bar. When you want to pay for your drink and tapa, you can ask for the bill – la cuenta. If it’s a very busy bar, you can simply hand the waiter a 20 or a 50 euro note and say ‘me cobra?’ which is a speedier operation. Hungry to check out some of the elegant tapas bars in the Puertochico area of Santander? Image by Pamela Cahill All rights reserved. If you are more confused now than before you started reading this post – worry not. 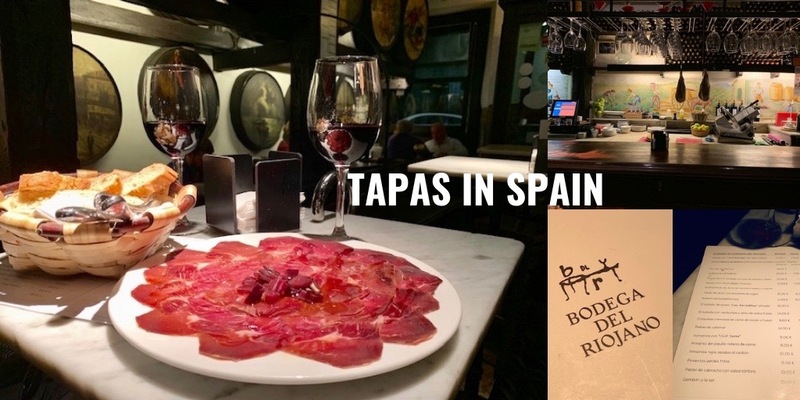 We can book you onto a tapas or a food tour for your first or second day in Spain and that will give you the insight and confidence to crack the tapas scene in Spain! Need a little more? We’ve travelled the length and breadth of Spain tasting the best tapas and would love to plan a trip that would take in the best of Spain’s miniature cuisine. Why not let us put our knowledge and experience to work for you? We can schedule cooking & language classes to ensure you taste the best of Spain – or place one of our expert guides with you to help find and manoeuvre the crowded bars in each city. And we can pre-book tapas bars when you are travelling as part of a group. Please note that we only book these tours and experiences as part of a custom tour. Posted in Entertainment, Food & Drink, Getting Around, Useful Information and tagged bars, beer, cava, pintxos, raciones, specials, tapas, tapas tour, vermouth, wine.